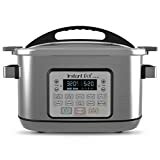 Before we even get to discussing this Instant Pot or the sale happening right now on Amazon, you definitely need to be made aware that this deal is going to sell out very, very quickly. Last time this coupon popped up on Amazon it was gone within an hour, so you had better hurry if you want to get in on the action! With that out of the way, the Instant Pot 8 Qt Aura Pro Multi-Use Programmable Multicooker with Sous Vide is pretty much a modern miracle that you never knew existed. It has a bunch of different cooking modes, which is obvious since it’s an Instant Pot. But it’s also the only Instant Pot model with a built-in sous vide cooking mode! It’s price at $150, but if you clip the on-site $32 coupon you can snag it at its lowest price ever. Hurry!